SF Framing - Your Best Source for Custom Picture Frames! | Treasured Memories… could light the corners of your life! Treasured Memories… could light the corners of your life! Custom Framed and Preserved Family Portrait with Acid Free Matting. Exactly why custom frame anything? Well, do you have an unusual item that has been inherited from friends or family, or a memento that you have had for years and cannot bear to part with? From old postcards or photographs, to gifts from distant lands where relatives traveled to explore new adventures, keepsakes can be a reminder of a special moment, a time in our lives we don’t want to fade or a memory of a loved one we don’t want to forget. An item passed down or collected over the years might seem unusual on the face of it, but could have a really special story behind it. Sadly, if not documented and well preserved, sometimes the origins of those treasures aren’t always clear. Which well-dressed relatives are in that old black and white photograph? Which great aunt created that beautiful needlepoint? Exactly where was that stunning watercolor painted? Many people save special items that become treasured heirlooms, and heirlooms often carry treasured memories. If you have an unusual item that has been inherited from friends or family, or an item you have had for years and cannot bear to part with, it’s time to preserve that memory before it is lost forever. If this sounds like you, or someone you know, SF Framing can help you preserve and proudly display that cherished object. Family heirloom framed in conservation UV acrylic shadow box. Family heirlooms are a wonderful treasure, but they can be easily damaged by light, heat, humidity, pests, and handling. Sunlight and fluorescent light fade and discolor most treasures, and are especially dangerous to fabrics, paper, and photographs. Historic objects can also be harmed by a variety of items including abrasive cleaners; glues, adhesive tapes, and labels; staples, and paper clips; acidic wood, cardboard, or paper; and pens and markers. Heirlooms stored away in a box bring much less enjoyment! By choosing to frame and display your family treasures, they can bring you great joy as they benefit from the protection of ultraviolet light-filtering glass. Before those memories fade away, SF Framing is making it easier than ever to preserve and display your memories with custom framing. 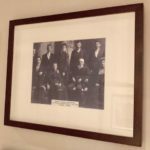 Mention this blog and we will offer you 50% off Museum Glass (for any size frame – yours or ours) until June 20, 2018. We look forward to seeing you (and your treasured possessions) very soon! This entry was posted in Helpful Hints, News, Tips and tagged 2017., 50% discount, Best buy, best deal, best framing services, custom framing, discount coupon, frame, framing, free gift, heirlooms, museum glass, picture framing, reward coupon, save big, select coupon, special coupon, special deal, support local on December 11, uv protection on January 21, 2018 by SF Framing, Sunnyvale.